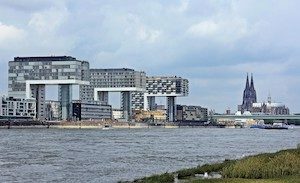 This is an 8 km ‘runseeing’ tour, incorporating several of Cologne’s architectural and historical highlights, a jaunt along the Rhine, and some lovely parks. 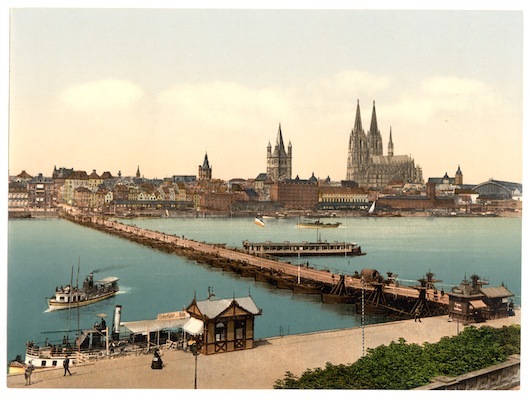 We start at the historic square of the Cologne cathedral (Kölner Dom), which was remarkably undamaged in WWII. Also located there is the Roman Germanic Museum. Take the path down to the water and head south through the Rheingarten park. At the romanesque St. Martin’s Cathedral, you’ll leave the river on Lintstraße for a short time to see more of historic Cologne, including the Fish Market, Alter Markt (Old Market), Heumarkt (Haymarket), historic City Hall, and the Jewish Architectural quarter. Then head back down to the Rhine, heading south again under the Deutzer Bridge, to the old harbor island (Chocolate Museum). This area has been refurbished in recent years, with wonderdul paths along a commercial Rheinhaufen corridor and along the water. After about 1.5 km, just past the Cologne University of Applied Sciences, turn right into Friedenspark and along the Oberländer Wall. The next sections of the run are along the old walls of the city, with a view to several towers. RIGHT on Titusstraße, RIGHT on Mainzer Str., The next 1km takes you to Volksgarten. LEFT on the Ring Road, to Chlodwigplatz (U-Bahn). Exit the rotary onto Merowingerstraße, then right on Volksgartenstraße, which will take you into the pleasant Park Volksgarten. Run about 0.75 km on the park paths, then exit and make your way back to central Cologne for 1.3 km along a series of main roads: Am Duffesbach, Weidenbach, Kleiner Griechenmarkt, and Fleischmengergasse, to Newmarket. 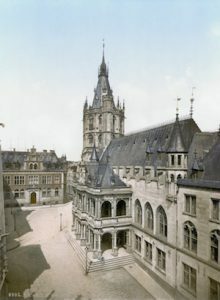 Now back in the center, turn RIGHT on Schildergasse, LEFT on Quatermarkt by the grand Standesamt Köln registry office and the Wallraf-Richartz-Museum, (oldest museum in Cologne and home to important Gothic, Renaissance & Impressionist collections), the Fragrance Museum, City Hall, Archbishop’s Diocesan Museum, and the Roman-Germanic Museum.